JMH – Java, SQL and jOOQ. What’s better? Using the JDK’s String.replace() or something like Apache Commons Lang’s Apache Commons Lang’s StringUtils.replace()? In this article, I’ll compare the two, first in a profiling session using Java Mission Control (JMC), then in a benchmark using JMH, and we’ll see that Java 9 heavily improved things in this area. That should be clear to everyone. The price to pay for this is the fact that the pattern is stored “far away” in some static member, rather than being visible right where it is used, which is a bit less readable. At least in my opinion. SIDENOTE: People tend to get all angry about premature optimisation and such. Yes, these optimisations are micro optimisations and aren’t always worth the trouble. But this article is about jOOQ, a library that does a lot of expression tree transformations, and it is important for jOOQ to eliminate even 1% “bottlenecks”, as they make a difference. So, please read this article in this context. What was the problem in jOOQ? We’re always escaping apostrophes by doubling them, and in some databases (e.g. MySQL), we often have to escape backslashes as well (unfortunately, not all ORMs seem to do this or even be aware of this MySQL “feature”). Unfortunately as well, despite heavy use of Apache Commons Lang’s StringUtils.replace() in jOOQ’s internals, every now and then a String.replace(CharSequence) sneaks in, because it’s just so convenient to write. Usually, in ordinary business logic, it shouldn’t (again – don’t optimise prematurely), but in jOOQ, which is essentially a SQL string manipulation library, it can get quite costly if a single replace call is done excessively (for good reasons, of course), and it is slower than it should be. And it is, prior to Java 9, when this method was optimised. I’ve done the profiling with Java 8, where internally, String.replace() uses a literal regex pattern (i.e. a pattern with a “literal” flag that is faster, but it is a pattern, nonetheless). Those are quite a few Pattern methods. The percentages have to be understood in the context of a benchmark, running millions of queries against an H2 in-memory database, so the overhead is significant! And much fewer Pattern calls are made, overall. 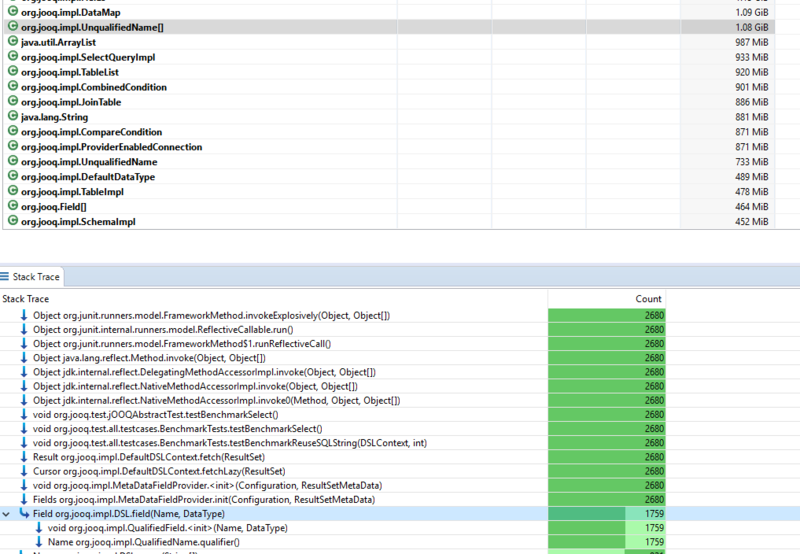 Profiling can be very useful to spot bottlenecks, but it needs to be read with care. It introduces some artefacts and slight overheads and it is not 100% accurate when sampling call stacks, which might lead the wrong conclusions at times. This is why it is sometimes important to back claims by running an actual benchmark. And when benchmarking, please, don’t just loop 1 million times in a main() method. That will be very very inaccurate, except for very obvious, order-of-magnitude scale differences. That’s important because different optimisations can be implemented for those different cases, and probably, in jOOQ’s case, there is mostly no match in this particular case. They fixed this in Java 9. Just update, don't use outdated versions of Java! This micro optimisation stuff matters in jOOQ because jOOQ is a library that does a lot of SQL string manipulation. Every allocation and every CPU cycle that is wasted when manipulating SQL strings slows down the library, and thus impacts all of its users. In a situation like this, it is definitely worth considering not using these useful JDK String methods, and opting for the much faster Apache Commons implementations instead. Things have improved a lot in Java 9, in case of which this can mostly be ignored. But if you still need to support Java 8 (we still support Java 6 in our commercial distributions! ), then this has to be considered.